Once rinsed, thoroughly dry them on paper towels. Preheat the oven to 400 degrees. Place all the seeds in one layer on a rimmed baking sheet. Drizzle oil on the seeds and toss with your hands. Seasoning can now be added if desired. Next, roast the seeds in the preheated oven for 25 minutes, stirring every ten minutes. They are done once golden with small amount of brown on the edges. Toss with a dash or two of salt while still hot. 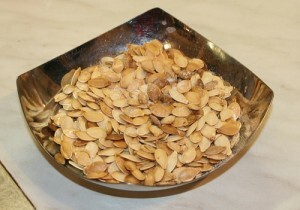 Pumpkin seeds are healthy and tasty, providing protein, zinc, magnesium, iron and calcium. For another tasty treat, try sprinkling them on green salads or sautéed vegetables.